I’ve just finished reading a seriously interesting and thought-provoking report; From Awareness to Funding: A study of library support in America and recommend it to anyone interested in understanding more about public library funding and/or marketing. investigate current attitudes and perceptions of public libraries; determine how best to challenge traditional misconceptions. identify whether implementation of targeted national marketing and advocacy campaigns would lead to an increase in public library funding. Although the results are based on an American sample, the message is relevant to anyone working in public libraries today. It highlights that public libraries undertake marketing and promotional campaigns to help increase footfall, drive usage, etc…but is this backed up with additional funding from the parent organisation to enable them to cope with, for example, an increase in new users or enhanced expectations? Probably not. This report attempts to develop a strategy, not only for increasing visitor numbers and challenging perceptions, but also for ensuring that our libraries are adequately funded and suitably equipped to respond to the needs of 21st century stakeholders. I won’t go into too much depth about the report as you can check it out for yourself here, and I’d recommend that you do, if you’re interested in the future of public libraries. In the UK we’re constantly bombarded with reports about the ‘credit crunch’ and predictions of a recession in the coming months; so the reality is that we might all have to re-evaluate how we secure funding for our public libraries…as there’s sure to be even more cutbacks on the way and we don’t want to be viewed as a ‘non-critical’ public service when the government attempts to slash the public sector budgets again! Thanks to Alan Poulter for forwarding on the OCLC report. Post offices to merge with public libraries? Anyone else find the latest ad campaign by the post office a bit annoying? The one where random celebs like Joan Collins and Westlife stop by to post their mail? Yeah, they’re totally believable aren’t they? Doesn’t look at all like the post office jumping on the celebrity bandwagon in a desperate attempt to appeal to a wider audience…. I can’t help but feel that this approach to marketing coupled with ongoing plans to open post offices in places like Tesco will do more harm than good and lead to the brand becoming devalued. That’s why I’m quite interested in plans announced today to relocate some post offices to public libraries. It’s certainly a better fit for the post office in terms of brand synergy, than aligning themselves with supermarkets. I’d be cautious, however, about the long term impact of operating what is essentially a revenue generating business out of a public library. As John Buschman, author of “Dismantling the Public Sphere” noted; in today’s society public libraries have an even greater responsibility to “provide alternatives and alternative spaces in a culture dominated by information capitalism and media image and spectacle”. I’m not completely against the idea of post offices in public libraries; I can see how it could benefit local communities and I look forward to hearing more as the idea progresses… I just hope that as a profession we don’t sell ourselves short on this one! Changing the way we Look at Libraries? My name in print – how exciting! My final report has just been published by Library Review – If you’re lucky enough to have an Emerald password and you’re interested in the impact that this festival had on the local community then check it out on Emerald. Alternatively, e-mail me direct and I’d be happy to share my findings with you. 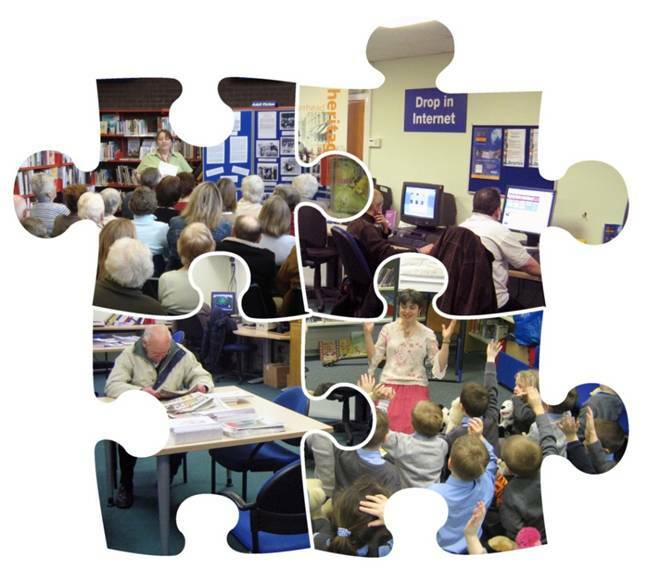 Social Networking: is there a place for public libraries in our virtual communties? I’ve recently observed a rise in posts about ‘social networking’ on the various public library mailing lists, professional journals, blogs and newspapers that I subscribe to. Wikipedia aside, Facebook seems to provoke the most heated debate amongst librarians discussing Web 2.0. Undoubtedly, social networking is a key element of 21st century online life, but is it appropriate for public libraries to occupy a space in this type of community? Facebook offers public libraries an opportunity to exploit a relatively cost effective marketing tool to promote services; interact with existing users and deliver an additional access point, suitable for reaching potential new users. East Renfrewshire Council in Scotland was the first in the UK to launch Facebook pages for all of their libraries . The Scotsman featured an interesting editorial piece about the launch and SLAINTE promoted the story on their website. “…there is absolutely no national leadership on the digital future of public libraries”. In fact, I find it incredibly confusing and worrying that some authorities in Scotland have banned the use of all social networking sites for a variety of reasons; fear that employees would waste time online or that library users would be exposed unnecessarily to commercial advertisements, or, perhaps, as I suspect, as the result of a lack of knowledge and expertise at a higher level? staff training to ensure Library Assistants understand the basics of the service and can help users to create their own profiles, join groups and network, should they wish. I think it’s time to establish a set of national guidelines and a best practice toolkit to ensure that the strong presence of public libraries in our physical communities is replicated effectively and appropriately in virtual communities online.